The Big List of Boarding School Resources! Home » Articles » Boarding School Notes » The Big List of Boarding School Resources! The beginning of the school year also kicks off the beginning of the boarding school admission calendar. Keep in mind that there is a boarding to serve almost every type of student. Boarding Schools come in all different shapes, sizes and flavors. If you're interested in boarding school, there's probably one for your child. But, what kinds of boarding schools are there and how can I tell them apart? How can I learn what type of school best fits my student? The best school can be very different for each student. You want your child to enroll in the school that will most effectively nurture him/her. Keep this idea front and center as you work through the process. Costs are important. You don't want to hide from, or ignore, costs in your boarding school search. Choosing a boarding school for your student is as much a financial, as educational, commitment. Applying for financial aid is part of the process for many families. The boarding school financial aid application is separate but concurrent to one's admission application. Our resources below are designed to help you get started with boarding school search process — everything from ID'ing school type, applying, working though financial aid applications, and much, much more. You might begin your search with "Public School vs. Private School: 25 Essential Considerations." Our ebooks are our biggest, broadest resources. Each takes you step-by-step through the admission and financial aid processes. 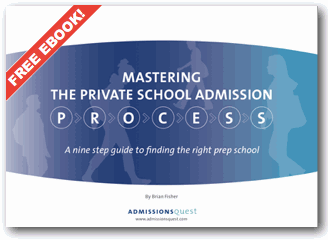 "Mastering the Private School Admission Process" takes you through the admission process from start to finish. It helps you to understand your student. From there we introduce you to the different types of schools. We cover applying, school selection, and even "thank you notes." "Private School Rankings: They're Misguided!" shows you why private school rankings are misguided. It dives into the concept of school fit and helps you ask, "What type of student does well in a particular school?" Learn to recognize the broad array of private school choices and how your student best fits a particular school. How to plan your financial aid application. The possible results of your financial aid application. What your family needs to do when applying for boarding school financial aid. How to open a conversation with financial aid officers. The international admission process works from beginning to arrival at your school. North American admission officers consider international applicants. 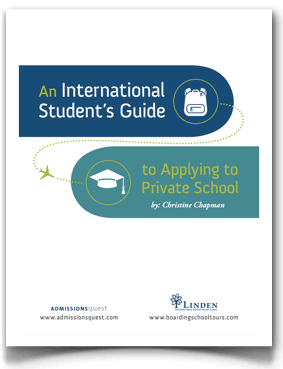 What an international family needs to do when applying to a North American boarding school. 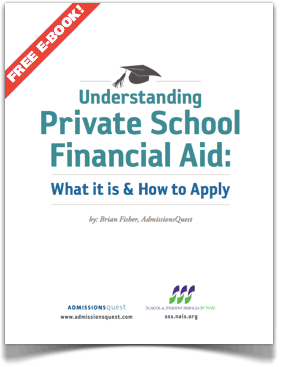 Essential Boarding School & Financial Aid Articles That Every Parent Needs to Read Today! While our ebooks are comprehensive in their approaches, we offer a host of shorter articles that address the steps of the admission and financial aid processes. 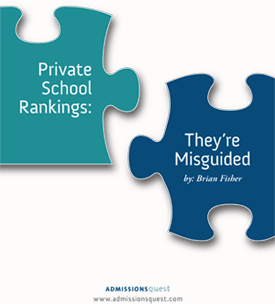 "Set Aside Notions of Private School Rankings" focuses on dispelling and setting aside belief in boarding school rankings. "Why Private School Fit Matters: A Parent's Voice" gives you an excellent, first-hand parent view into the importance of school fit. "What's the best school?" Good question! When a family asks me about the best school, I always answer 'it depends' on who your student is and on what he/she needs to grow the furthest. "The Benefits of a Girls' School Education" dives into the research associated with single gender education. "Catholic School Benefits" are many. Learn about the opportunity to grow spiritually and academically for students whose faith and school are important. "A Post Graduate Year; what's that?" provides a thorough review of the "13th year" of school. Read about the compelling reasons for an extra year of high school. Students can work on their athletics, academics, and improve maturity during a post-graduate year. Sometimes financial aid packages look great until the term bills arrive from your school. You must make sure that you know any, and all, expected costs beyond tuition, room and board. Our article, "What is the True Cost of Boarding School?" helps you to break it all down. It's Time to Research! Dive into our exhaustive lists of boarding schools. Once you know the kind of school that best fits your child, it's time to kickoff your search and dive into the more than 300 boarding schools in our database. Looking for a coed urban boarding school; a small rural progressive boarding school; a girls school; a boys school; a school with a religious affiliation; an international school; one close to home; further away from home. Research our lists of boarding schools. We cover almost everything you might consider in a boarding school — locations, activities, educational practices, athletics. You name it. We have you covered!